What if you could get a DSLR that is small, inexpensive and easy for beginners to use, while still being powerful enough for a more experienced photographer? 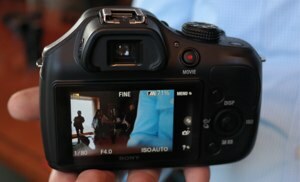 Sony's new Alpha 3000 just might be that camera. The Alpha 3000 is on the small size for a DSLR, measuring just 101.6 x 58.1 x 38.3 mm. This makes it more compact than the 116.8 x 90.7 x 69.4 mm Canon EOS Rebel SL1 ($649), which claimed the smallest DSLR title earlier this summer. 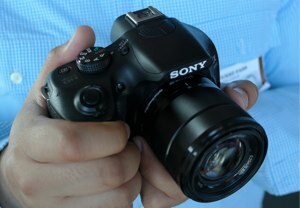 Sony's new camera is not only smaller but a few hundred dollars less expensive at $399. Like the Rebel SL1, the size is nice but not nearly as compact as a mirrorless camera. The Alpha 3000 will be easier to carry around than a bigger-bodied camera and offer more robust functionality than a mirrorless interchangeable lens camera (MILC) like Sony's NEX line or the Olympus PEN series. Though small overall, the Alpha's grip is much more natural and comfortable than the SL1's and the light weight makes it easy to use and balance with one hand. This camera comes with a standard 18-55mm f/3.5-5.6 kit lens that doesn't throw the camera off balance (an issue we often encounter with MILCs). If you want a smaller lens to match the smaller body, you're in luck. The Alpha 3000 accepts E Mount lenses, same as the NEX series, of which there are already over a dozen, including a compact 16-50mm retractable zoom lens. Sony is also introducing three new E Mount lenses in the coming months, including an 18-105mm f/4 power-zoom G lens optimized for video that will be available in December for around $600. Sony is heavily emphasizing the Alpha 3000's video prowess, even with the kit lens. Owners will be able to record full HD 1080p video at 24fps and enjoy snappy auto focus. This same speed is promised for photos as well, even when using Live View. The 100 percent full-view Tru-Finder (viewfinder) is electronic, not optical, and displays key shooting information as well as a live preview of any enhancements, including artistic image filters. The Alpha 3000 has all the settings and modes you'd expect from a DSLR plus some extra creative and easy Auto settings for people still learning about photography. Even if you're well-versed in the ways of the camera, the Auto modes should make it easier to get a good shot without having to adjust settings. Between auto object framing, advanced noise reduction (100 - 16000 ISO), and creative filters, many different kinds of professional-looking shots are possible. If all this isn’t enough to tempt you, how about the $399 price? This is less than the nearest entry-level competition, the highly-rated $550 Nikon D3100. You'll be able to get your hands on the Sony Alpha 3000 in early September.